Sunday $5,000 GTD events with 10,000 starting stack and 15-minute blinds are to take place every Sunday from 7pm New York time while there will be a minimum of three daily satellites alongside more on the days of the competition. Those unwilling to shell out the $55 buy-in can win spots into Sunday $5,000 GTD competitions via turbo re-entry satellites, which take place Mondays to Fridays at 4:30pm, 8:30pm and 10:30pm. There will also be satellites on Fridays and Saturdays from 9:30pm and Sundays at 4:05pm, 5pm, 5:30pm and 6pm. Online poker aficionados can buy in to weekly tournaments for $55 or win their seats via satellites. 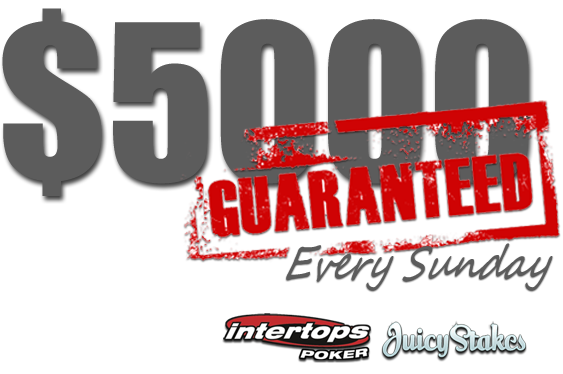 Intertops Poker and Juicy Stakes recently added a second $1,000 guaranteed poker competition to their Friday schedules to partner their $1,000 guaranteed deep turbo re-entry event while both additionally offer a wide selection of online casino games from developer Cake Gaming. “So many players have said ‘what happened to the Sunday night $5K guaranteed that we just had to bring it back,” read a statement from Intertops Poker.